We’ll read Thanksgiving stories and have fun with our Thanksgiving songs and poems. Look for our Pilgrim and Mayflower art projects! 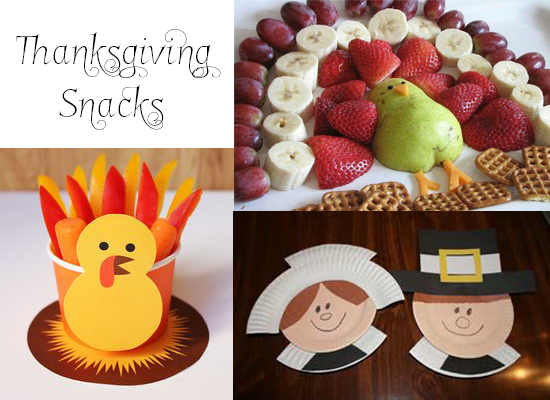 We’ll make an edible “fruit” turkey to share with our friends and miniature turkey vegetable snacks( feathers of green, yellow, red and orange peppers )! A through H letter review this week ( letter writing practice ) and we’ll use candy corn for a math counting and graphing activity. We’ll practice writing numbers 3 and 8. I’ll complete progress reports/information for the children and send them home on November 30. This week each child will be encouraged to listen to instructions and wait in turn to talk and respond during story and circle time. They will also be encouraged to play with each other in a kind and respectful manner. ENGLISH- Letter “J” and its sound, naming as many “J” words as we can. MATH- We will be developing our number use through games and activities.Connect numerals to the quantities they represent. CIRCLE TIME ACTIVITIES- “J” words and sound, number math, days of the week, 12 months, shapes and colors.We will read at least one story each day. Discuss what we have to be thankful for. 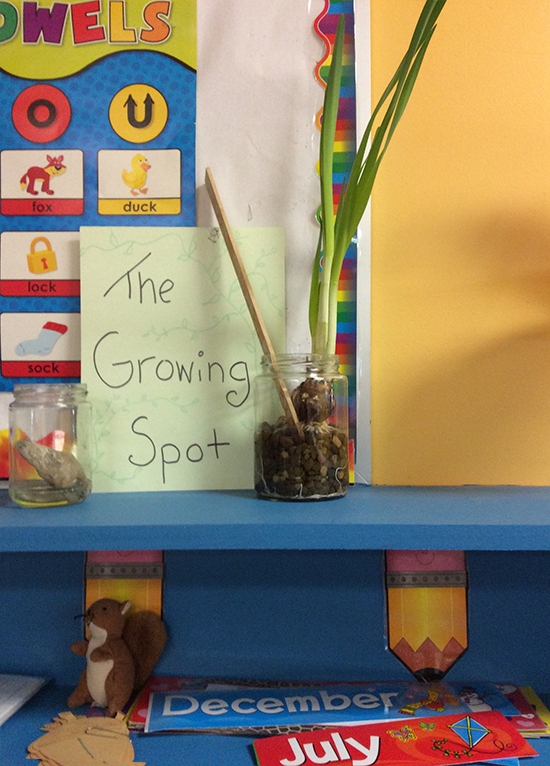 Ask your children about our “Growing Spot.” Miss Wendy started our indoor garden in a jar with a narcissus bulb, small stones and water. The children have been fascinated watching the roots and stems grow. We’re expecting a blossom any day now! This week’s letter is H and we’ll make helicopters, hippos and hand-print turkeys. Please ask your children to practice the H sound and identify H words. At circle time we’ll continue to talk about thankfulness, family and friendship and the importance of kindness to all. Our Scripture this month is Colossians 3:20— Children, obey your parents in all things. We’ll use turkey “feathers” for a math counting and sorting activity and an A through H letter review. Look for our hibernation worksheets that we’ll complete after a lesson and story at circle time. We’ll do scissor skills/ paper cutting practice and begin writing names in uppercase and lowercase letters. This week each child will be encouraged to join in and participate during singing, story time and circle time. They will also be encouraged to play with each other in a kind and respectful manner. MATH: We will be developing our number sense through games and activities. We will be counting to determine how many objects are in a set.The child, given two sets, each containing 10 or fewer concrete objects, will identify and describe one set as having more, fewer, or the same number of members as the other set, using the concept of one-to-one correspondence. We will read at least one story each day. Germs. Where do they live? How do we prevent them from living? Use glitter on hands to represent germs and the shake each other’s hands to show spread of germs. Look for our art projects: colorful bunches of grapes and gorgeous giraffes! For a special treat we’ll make granola ( oats, raisins and Cheerios ). We’ll measure, mix and share our snack! We’ll use grapes and graham crackers for math activities: simple fractions and sorting and counting. Please practice the G sound ( hard and soft ) and ask your children for G words! 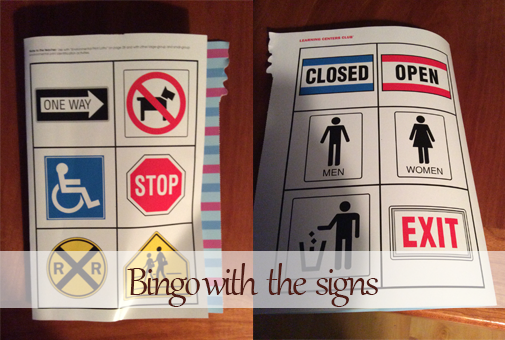 To develop prereading skills and enviromental awareness we’ll play Bingo with the signs we see all around us that keep us safe ( Stop, Exit, One Way etc.). We’ll read Give Me Half ( understanding halves ) by Stuart Murphy and Goodnight, Gorilla by Peggy Rathmann. This week each child will be encouraged say “please” and “thank you”. Also,we will work on giving a response during circle time. ENGLISH- Alphabet review of A to H , revising what we have covered in the previous few weeks. A to H review, shape review, number math,days of the week and 12 months. We’ll review letters D, E and F this week: beginning sounds and D, E and F words. We’ll do an uppercase and lowercase matchup. 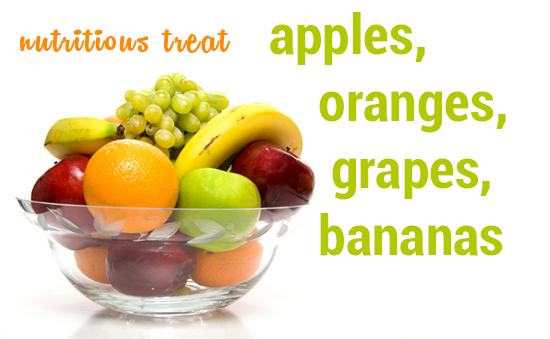 We’ll make fruit salad: identifying, preparing and combining apples, oranges, grapes and bananas for a tasty and nutritious treat! At circle time we are reviewing days of the week, months of the year (ask your child to sing our songs) and we will play a name recognition game. Each child will say his/ her name and its beginning letter and then with help spell it out for our class. Wednesday 11/4 is Show and Tell ( an activity we’ll do every 2-3 weeks on alternating days ). 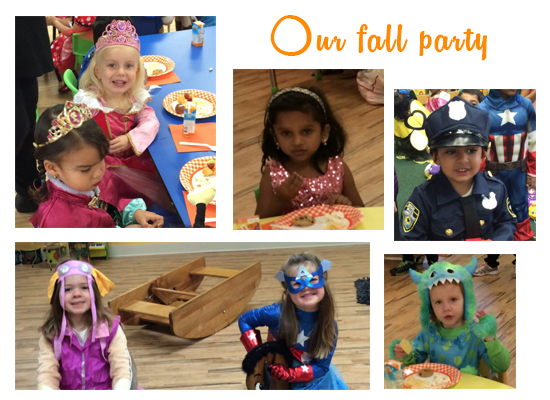 Please have your child bring in something special beginning with letter D, E or F! Using ears of corn and yellow kernels ( pompoms) we’ll do a math counting and comparing sets activity. With aluminum foil we’ll create stampers and use colorful paints for a unique art project! In our workbooks and on worksheets we are working with letter and number recognition and formation.